Four Japanese electric power companies dashed to apply for safety regulatory safety examinations of 10 reactors Monday, July 8, the day tougher standards that are hoped to prevent a repeat of the 2011 Fukushima Daiichi nuclear catastrophe took effect – and more are lining up – nuclear regulators there told Bellona, while fretting they simply may not yet be ready to tackle the barrage of requests. The regional power utilities rushed to the Nuclear Regulatory Agency (NRA) to hand in their applications for safety assessments on their reactors in hopes of cutting their fuel costs, which have soared since the loss of atomic power forced them to revert to thermal power generation, an NRA official wrote in an email interview with Bellona. But the mad flurry of application-waving utilities anxious to reopen the sluices of nuclear power have revived lingering concerns that the NRA – which was quickly created out of the ashes of the Nuclear and Industrial Safety Agency (NISA) has the necessary manpower and independence to truly diagnose Japan’s nuclear health. NISA was tarred for its crony relationships with nuclear power promoter, the Japanese Atomic Energy Agency, and discredited for lying during the worst of the Fukushima disaster . The official, who requested anonymity as he is not authorized to discuss the inspections publicly, said the rush of applications was widely anticipated, especially after the regulatory body on in late June gave the green light to Japan’s only two nuclear reactors at the Ohi plant, which were allowed to restart last summer after the Fukushima disaster to continue operations until September. The NRA has “largely accepted” a written evaluation concluding that there are no immediate severe safety issues at the No 3 and 4 reactors at the Ohi station in central Japan under the new regulatory standards that took effect on Monday, World Nuclear News reported. Nevertheless, in its 24 June ruling, the regulator ordered the Kansai power company, which owns Ohi, to ensure that several items of equipment that were not in compliance with the new standards were rectified by the end of June. Kansai confirmed in a press release dated 1 July that all the prescribed measures had been completed, said WNN. The NRA, in its first public test of the kind of venom it can excrete against the nuclear industry, was reportedly disappointed by Kansai’s behavior surrounding the operational extentions for the Ohi reactors. According to the NRA, one of the major challenges in Japan is to nurture a safety culture — but there is apparently no quick remedy. “It may take quite a long time, but we hope to make efforts on a daily basis because it will be difficult to secure safety in a real sense unless society, including operators, has such an awareness,” Tanaka said at a separate press conference earlier in the month. The Ohi No 3 and 4 reactors are the only two reactors of Japan’s 50 that are currently in operation. The rest were idled in the wake of the Fukushima accident or were at the time of the accident in shutdown state for maintenance and not allowed to restart. Tokyo Electric Power Co. (Tepco) – owner of the still embattled Fukushima plant, where, on March 11, 2011, a triple meltdown triggered by an earthquake and tsunami occurred – is not among the companies vying to have their restart applications reviewed. The company has expressed plans to request an NRA safety review for two reactors at its seven-reactor Kashiwazaki-Kariwa plant, the largest in the world, but local opposition made it difficult for the utility to apply Monday, the Japan Times reported. The new safety rules imposed by the NRA are intended to protect reactors from damage caused by natural disasters in this earthquake-prone nation, with a special focus on contingencies against core meltdowns and tsunamis – the direct caused of the Fukushima catastrophe. But none of the reactors is likely to be restarted anytime soon as it could take at least six months for each assessment to finish. Facing what the NRA calls the “world’s toughest level of nuclear regulations,” utilities may also opt to abandon efforts to restart some of the other 50 commercial reactors and scrap them instead of investing in costly safety upgrades. “We have worked to create the world’s toughest regulatory standards […] and I think we have been able to make something close to what we have aimed at,” NRA Chairman Shunichi Tanaka told reporters after the new safety requirements were finalized on June 19. Does the NRA really have the staff it needs? For the new inspections, the NRA will set up three teams consisting of about 80 members for the safety examinations, the NRA official told Bellona. Examinations will include interviews with employees and on-the-spot checks. But doubts hang over whether the NRA, a fledgling entity launched in September, has sufficient personnel and capabilities to carry out stringent safety assessments while utilities rush its corridors to get their reactors examined as quickly as possible. The uncertainty is present within the NRA itself, where the official who spoke with Bellona said he had no idea how many reactors the 80-person teams could evaluate simultaneously, saying the agency “has no choice but to do its best” with current staff numbers. Added to that wan endorsement is the fact that the NRA is jammed with former NISA staff, which NRA officials told Bellona in March hobbled their public image. Agency head Tanaka told the Japan Times that NISA staff will have to rise to the challenge of improving their expertise in conducting safety assessments. Reactors must also have a venting system with filters that can reduce the amount of radioactive substances when pressure needs to be vented from reactor containers during emergencies, but pressurized water reactors like unit 3 at the Ikata plant are given a five-year moratorium to meet the requirement. But prospects look bleak for aging units that will not only have to satisfy the new regulations but also undergo special inspections to continue to operate beyond 40 years. The existence of active faults running beneath atomic plants could also be a critical factor that will result in the permanent shutdown of reactors, the NRA official wrote. But the NRA has instated a new rule requiring local approval for reactor restarts as well. 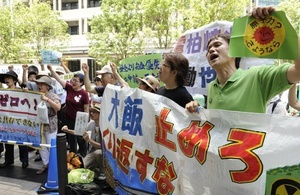 Utilities passing the NRA inspections can only restart operations if they obtain consent from local governments and approval from the central government, Asashi Shimbun Newspaper reported. Utilities can restart reactors that pass the NRA’s inspections if they obtain consent from local governments and approval from the central government. But how utilities will get the final go-ahead for the restart of reactors is vague, leaving room for confusion as local governments are reluctant to take all the responsibility for making a decision on the sensitive issue. The new safety rules fall under the Nuclear Reactor Regulation Law and were drafted after the Fukushima disaster, which shattered public trust in the government’s incantations that Japanese nuclear plants were safe from natural disasters. If the NRA concludes that a reactor does not meet the standards, it can order the electric power company to improve certain equipment or continue to suspend the operations, Asashi Shimbun said. The NRA introduced the “backfit” system, in which utilities are required to improve or renew existing equipment to meet the latest standards. The new standards require utilities to install a filtered system to curb emissions of radioactive materials to the outside environment when venting is needed to reduce pressure within a reactor, said the paper. According to the NRA, he standards also call for the establishment of quake-resistant buildings that can be used as emergency headquarters if a nuclear accident occurs. The new standards also urge companies to upgrade their measures to deal with tsunami and earthquakes, as well as to minimize damage from terrorist attacks using aircraft. The NRA as of July 8 also limits the operations of a reactor to 40 years in principle. A utility wanting to operate a reactor for more than 40 years must not only meet the new standards, but also must inspect in detail possible deterioration at the facility, said Asashi Shimbun. Which reactors want back online? In addition to Kansai’s Ikata No 3 reactor, the company’s other two pluthermal reactors, the No 3 and No 4 instalations at its Takahama plant in Fukui Prefecture will undergo examinations. The seven other reactors are: the Nos. 1 to 3 reactors at the Tomari nuclear power plant, operated by Hokkaido Electric Power Co.; the Nos. 3 and 4 reactors at Kansai Electric’s Oi nuclear power plant in Fukui Prefecture; and the Nos. 1 and 2 reactors at the Sendai nuclear power plant in Kagoshima Prefecture, operated by Kyushu Electric Power Co, according to Asashi Shimbun. While lawmakers in the ruling Liberal Democratic Party from electoral districts hosting nuclear power plants have expressed hope that reactors will be restarted quickly, according to the Japan Times, Taro Kono, a rare antinuclear figure inside the LDP, warned during a meeting of lawmakers that restarts may not come as easily as thought. COMMENT: A chronicle of nuclear decay: Over half a year later, what have we learnt from Fukushima? Concerns mount over the growing threat from Fukushima’s spent fuel – will the experts’ warning call be heard?